This Video Tutorial illustrates how to use Item enumerator to loop through a pre-defined data table. A data table with multiple columns can be defined in the Item Enumerator, data type of columns can be different. Item Enumerator then will loops through each record, pick each column value and insert that into package variable. In this example there are two database servers for employee information; each database server has a different db name, and different table name. we will define a data table with three columns; server, database, and table. then we will fill two record entries, one for each database server. then we will loop through this data table with Item Enumerator and get data from source tables into the destination table where records are not exists in the destination table. This Video Tutorial illustrates how to use SMO enumerator to loop through linked servers. SMO stands for SQL Server Management Objects, and using SMO provides ability to loop through list of metadata objects of SQL Server database or instance. This enumerator can be used for looping through jobs, linked servers, data files of database, and many other metadata structures of SQL Server instance. This Video Tutorial illustrates how to use ADO.NET Schema Rowset enumerator to loop through metadata information of a data source. ADO.NET Schema Rowset provides ability to loop through list of metadata and schema provided from a data source. 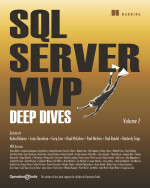 For example when data source is SQL Server, the metadata will be fetched from INFORMATION SCHEMA views. Looping through all tables under AdventureWorks2012 database with Sales Schema, and export each table to a CSV file. Structure of tables are different, so data flow cannot be used because data flow in SSIS 2012 doesn't support dynamic metadata. So we use BCP command to export data from SQL Server tables into CSV files. the SQL Command for BCP will be generated dynamically inside the foreach loop and then it will be run using Execute SQL Task. This Video Tutorial illustrates how to use From Variable enumerator to loop through an array list. From Variable provides ability to loop through an array that filled from a script task. Collection structures such as Array and ArrayList can be loaded into an Object type variable in the SSIS package, and then Foreach Loop with From Variable Enumerator can loop through the variable. Source CSV files come into a source directory. we want to load data from each source file into a database table, and then move that file into the archive folder. But we want to do the data load for only new files. We use a script task to find new files based on System.IO namespace objects, and then we will load new file pathes into an array list, then the array list will be loaded into an Object type varaible of the package. Finally we use a Foreach loop with From Variable to loop through items of that array list, and load new files into the database table, and then archive them. This Video Tutorial illustrates how to use Nodelist enumerator to loop through an XML content with Foreach Loop structure. Nodelist uses XPath query language for interating through nodes, elements, attributes of an xml content, that might come from file, variable, or static string. In this sample we call a web service to select name of all teams played in Football worldcup 2010 (reference for this web service is www.xmethods.net). Then through the Foreach loop container, which choosing Nodelist enumerator with ElementCollection, we loops through each team information with OuterXPath, and then fetch name based on the InnerXPath, and load it into the TeamName variable. The TeamName variable then will be used as an input parameter for the second web service to fetch the full details of each name into xml file named based on the team, such as Brazil.xml. This Video Tutorial starts with an introduction to Contianers in SSIS 2012, then it explains different kind of enumerators in foreach loop contianer. Finally this video will focus on File Enumerator, and shows an example of loading multiple CSV files into a destination table. In the example you will learn how to implement a loop structure in SSIS package, to iterate through CSV source files which contians customer data rows, and extract data rows into destination database table. you will also see how you can move files to archive folder, and write an entry with source file name and datetime into a log table. In this video you will learn how to use Foreach Loop File Enumerator with Variables, Expression Task, Connection Manager's expression setting to create a dynamic data flow that works for multiple files with same structure in the source folder. I've created another video of SSIS 2012 Tutorial Videos series. In this video samples of Execute Process Task illustrated. Execute Process Task provide ability to run executable files from SSIS package. Continue reading "Execute Process Task - SSIS 2012 Tutorial Videos"
This is a video tutorial about how to use Web Service Task in SSIS. 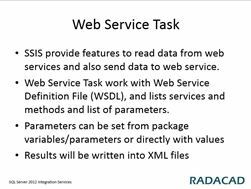 In this tutorial you will learn how to use Web Service Task to send parameters to web service methods and get response and save response into xml file. this video has samples of work with World Cup 2010 Football Championship web services.